The clever folk at Blacker Yarns have released a real beauty of a yarn this week - the Tamar Lustre Blend - and I was thrilled to have the chance to play with a skein or two of this recently. The yarn is a worsted spun blend of Wenslydale, Teeswater, Cotswold and Black Leicester Longwool all which add a fabulous shine and lustre. To add a suitable amount of woolly 'bounce' 30% Cornish Mule has been added and the end result is really rather wonderful. First onto my needles was the 4ply version (a dk version is also available) and as soon as I got my paws on it Iknew it would work beautfully in garter stitch. Knitted up at a relaxed gauge on 4mm needles the 4ply yarn had great stitch definition but also good drape and sheen too - properties that you don't often find combined in a yarn. This yarn would be absolutely perfect for a large 2 or 3 colour shawl and the fabulous range of colours is perfect inspiration. I can see this as a large, wrappable, wearable garter stitch shawl or maybe something with a Hap-style construction. The slight stickiness of the yarn, thanks to the Cornish Mule, would also lend itself well to fair isle and other colourwork techniques should the fancy take you. The only difficulty might be in choosing your colours, but the handy shade card can help you with this. And, the even better news is that, unlike the Cornish Tin which was such a hit last year, Tamar Lustre is going to a permanent stock yarn. So you should have ample opportunity to snag some for yourself. All in all, a real gem of a yarn and one that I will certainly be seeking out at Edinburgh Yarn festival. I am really pleased to be able to share my latest pattern with you today. Contours is designed using delicious Blacker Yarns Shetland DK yarn, specifically to showcase the wonders of natural gradients. Knit entirely in garter stitch with yarn-over increases, this fun, crescent shaped shawl lets you relax and enjoy the play of natural wool shades, An i-cord bind off - attached as you work - provides a perfect finish to this relaxed and fun knit. Although beautiful as a natural gradient, this pattern would also work well in modern brights or by pairing a colourful single skein with a more neutral background. The pattern is for sale via Ravelry - here - but if you would like to win a free copy of the pattern head over to my Instagram account for a chance to win. I'm very pleased to be able to whizz by this morning and show off my latest pattern. The Sty Head Tarn socks were inspired by one of our favourite picnic spots when we are holidaying in the English Lake District. We have been there in snow, ice, sun and gales. Each time it is beautiful in a different way. As with many of my patterns this can be worked toe-up up or cuff down - go on - I dare you to try a different way this time! I am also experimenting with a different pricing structure on my Ravelry shop. Add any 4 of my patterns to your cart and receive an automatic 20% discount. As the temperature reaches 32 F here, what better way to celebrate than with woolly socks. What better way to kick off my new website than with a brand new pattern for spring. 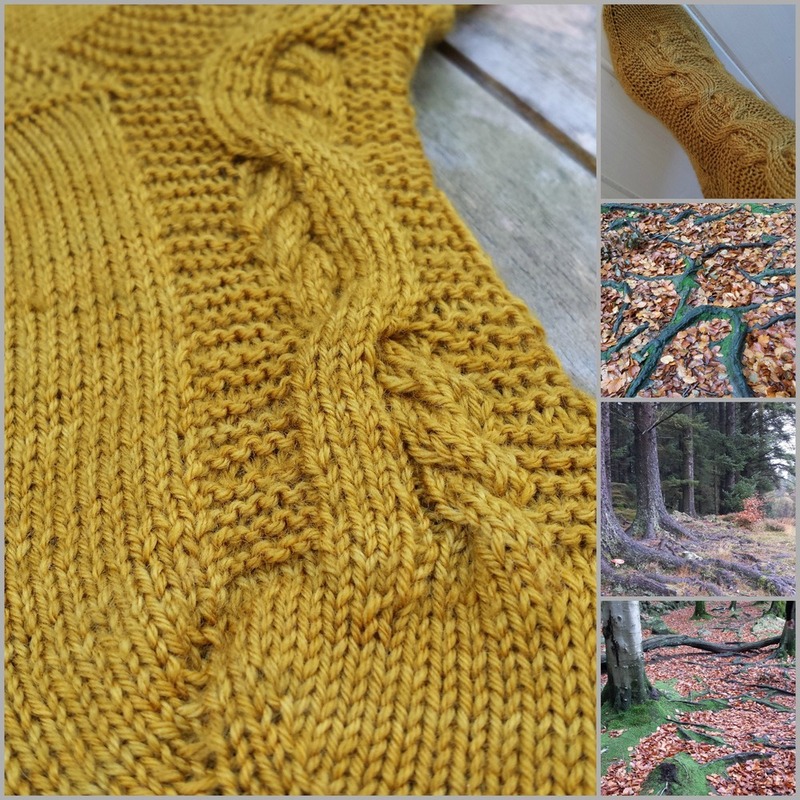 Beltane is a collaboration with the wonderful Eleanor of Solstice Yarns who loves to hand-dye yarn in fabulous nature-inspired colours. Her yarns are really a joy to behold and my limited photographic skills certainly don't do them justice. The colourway for these socks is Feathered Nest - inspired by duck egg blue bird's eggs nestling in a cute twiggy nest. These socks feature an unusual twisted cable which is fun but surprisingly simple to work and a little elegant ribbing to keep the look unisex and ensure a good fit. As usual, the pattern is offered in both toe-up and cuff down formats - as I know that not everyone shares my enthusiasm for the toe-up way. Also, the sample as shown features the Fish Lips Kiss Heel - my new favourite. The pattern when purchased will have my usual heel flap construction but if you would like to try a new heel which works with both toe-up and cuff down then I highly recommend giving the Fish Lips Kiss Heel a try. At just $1 (approx 60p) the pattern is superb value for money and gives a wealth of information which I'm sure will be of value in your sock knitting journey. 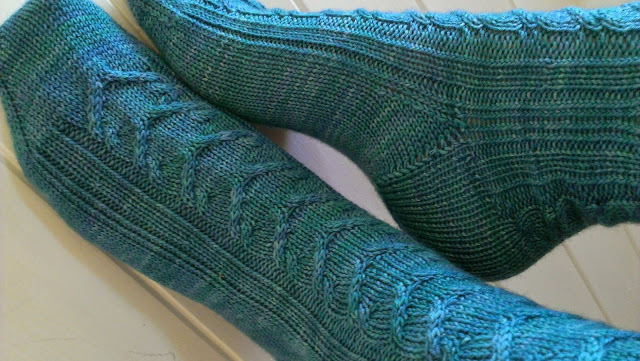 So, if you'd like to welcome the arrival of spring with a bit of sock knitting how about joining us for a KAL, over on the Solstice Yarns group. There are no rules, other than having fun and chatting and all are welcome.